Reprinted from the Journal of the Shudokan Martial Arts Association, Volume 17 #2). Sato Tadayuki Sensei is one of the world’s leading Shodokan aikido experts. He was taught by Tomiki Kenji Sensei, founder of Shodokan aikido, in the living room of his house every Sunday before tea, and so he has an in-depth knowledge of Tomiki Sensei’s aikido system. He is also an accomplished judoka. Sato Sensei, sixth dan, was granted the position of Shihan of Waseda University Aikido club in 2007. This position has been vacant since Professor Tomiki’s death in 1979. He is an expert in his field, and in particular, the link between Kodokan judo and Tomiki-style aikido. He also teaches aikido at the Japan Police University, and he lives in Tokyo. John Gage Sensei has been studying and teaching Japanese martial arts in Tokyo since 1986 when he joined the American Embassy Judo Club, which was lead by the late Sato Shizuya Sensei. Following the death of Sato Sensei, he became the leader of this well-established dojo, and he has been a member of the Kodokan Judo Institute since 1991. He has earned a seventh dan in Sato Sensei’s system of modern jujutsu, and he has a fifth dan in judo. He has taught seminars in judo and jujutsu in Belgium, Denmark, France, Germany, Hungary, Romania, the U.K., and the USA. Contact Suino Sensei soon to get more details about this rare world-class training opportunity in world-class judo, aikido, and jujutsu. He can be reached at info@japanesemartialartscenter.com or (734) 645-6441. 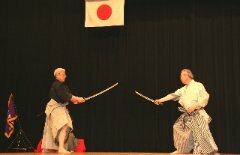 Direct link to the event is http://portfolioannarbor.com/MartialArtsSeminar.html. When planning your trip to Ann Arbor, contact Davies House Inn. Located less than two miles from the dojo, we are pleased to have partnered with Japanese Martial Arts Center to offer special pricing for participants in this seminar. Jan Davies McDermott, owner and innkeeper at Davies House Inn, can be reached at innkeeper@davieshouseinn.com or (734) 973 1722 or (734) 417 5745.